A stock market or equity market is a public entity (a loose network of economic transactions, not a physical facility or discrete entity) for the trading of company stock (ares]]) and derivatives at an agreed price; these are securities listed on a stock exchange as well as those only traded privately. The size of the world stock market was estimated at about $36.6 trillion at the beginning of October 2008. The total world derivatives market has been estimated at about $791 trillion face or nominal value, 11 times the size of the entire world economy. The value of the derivatives market, because it is stated in terms of notional values, cannot be directly compared to a stock or a fixed income security, which traditionally refers to an actual value. Moreover, the vast majority of derivatives 'cancel' each other out (i.e., a derivative 'bet' on an event occurring is offset by a comparable derivative 'bet' on the event not occurring). Many such relatively illiquid securities are valued as marked to model, rather than an actual market price. The stocks are listed and traded on stock exchanges which are entities of a corporation or mutual organization specialized in the business of bringing buyers and sellers of the organizations to a listing of stocks and securities together. 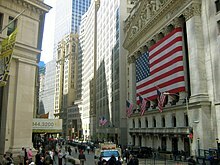 The largest stock market in the United States, by market capitalization, is the New York Stock Exchange (NYSE). In Canada, the largest stock market is the Toronto Stock Exchange. Major European examples of stock exchanges include the Amsterdam Stock Exchange, London Stock Exchange, Paris Bourse, and the Deutsche Börse (Frankfurt Stock Exchange). In Africa, examples include Nigerian Stock Exchange, JSE Limited, etc. Asian examples include the Singapore Exchange, the Tokyo Stock Exchange, the Hong Kong Stock Exchange, the Shanghai Stock Exchange, and the Bombay Stock Exchange. In Latin America, there are such exchanges as the BM&F Bovespa and the BMV. Participants in the stock market range from small individual stock investors to large hedge fund traders, who can be based anywhere. Their orders usually end up with a professional at a stock exchange, who executes the order of buying or selling. Some exchanges are physical locations where transactions are carried out on a trading floor, by a method known as open outcry. This type of auction is used in stock exchanges and commodity exchanges where traders may enter "verbal" bids and offers simultaneously. The other type of stock exchange is a virtual kind, composed of a network of computers where trades are made electronically via traders. Actual trades are based on an auction market model where a potential buyer bids a specific price for a stock and a potential seller asks a specific price for the stock. (Buying or selling at market means you will accept any ask price or bid price for the stock, respectively.) When the bid and ask prices match, a sale takes place, on a first-come-first-served basis if there are multiple bidders or askers at a given price. The New York Stock Exchange(NYSE) is a physical exchange, also referred to as a listed exchange – only stocks listed with the exchange may be traded, with a hybrid market for placing orders both electronically and manually on the trading floor. Orders executed on the trading floor enter by way of exchange members and flow down to a floor broker, who goes to the floor trading post specialist for that stock to trade the order. The specialist's job is to match buy and sell orders using open outcry. If a spread exists, no trade immediately takes place—in this case the specialist should use his/her own resources (money or stock) to close the difference after his/her judged time. Once a trade has been made the details are reported on the "tape" and sent back to the brokerage firm, which then notifies the investor who placed the order. Although there is a significant amount of human contact in this process, computers play an important role, especially for so-called "program trading". The NASDAQ is a virtual listed exchange, where all of the trading is done over a computer network. The process is similar to the New York Stock Exchange. However, buyers and sellers are electronically matched. One or more NASDAQ market makers will always provide a bid and ask price at which they will always purchase or sell 'their' stock. From time to time, active trading (especially in large blocks of securities) have moved away from the 'active' exchanges. Securities firms, led by UBS AG, Goldman Sachs Group Inc. and Credit Suisse Group, already steer 12 percent of U.S. security trades away from the exchanges to their internal systems. That share probably will increase to 18 percent by 2010 as more investment banks bypass the NYSE and NASDAQ and pair buyers and sellers of securities themselves, according to data compiled by Boston-based Aite Group LLC, a brokerage-industry consultant. A few decades ago, worldwide, buyers and sellers were individual investors, such as wealthy businessmen, usually with long family histories to particular corporations. Over time, markets have become more "institutionalized"; buyers and sellers are largely institutions (e.g., pension funds, insurance companies, mutual funds, index funds, exchange-traded funds, hedge funds, investor groups, banks and various other financial institutions). The rise of the institutional investor has brought with it some improvements in market operations. 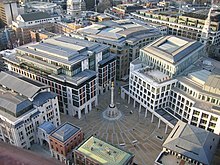 There has been a gradual tendency for "fixed" (and exorbitant) fees being reduced for all investors, partly from falling administration costs but also assisted by large institutions challenging brokers' oligopolistic approach to setting standardised fees. In 12th century France the courretiers de change were concerned with managing and regulating the debts of agricultural communities on behalf of the banks. Because these men also traded with debts, they could be called the first brokers. A common misbelief is that in late 13th century Bruges commodity traders gathered inside the house of a man called Van der Beurze, and in 1309 they became the "Brugse Beurse", institutionalizing what had been, until then, an informal meeting, but actually, the family Van der Beurze had a building in Antwerp where those gatherings occurred; the Van der Beurze had Antwerp, as most of the merchants of that period, as their primary place for trading. The idea quickly spread around Flanders and neighboring counties and "Beurzen" soon opened in Ghent and Amsterdam. In the middle of the 13th century, Venetian bankers began to trade in government securities. In 1351 the Venetian government outlawed spreading rumors intended to lower the price of government funds. Bankers in Pisa, Verona, Genoa and Florence also began trading in government securities during the 14th century. This was only possible because these were independent city states not ruled by a duke but a council of influential citizens. Italian companies were also the first to issue shares. Companies in England and the Low Countries followed in the 16th century. The Dutch East India Company (founded in 1602) was the first joint-stock company to get a fixed capital stock and as a result, continuous trade in company stock emerged on the Amsterdam Exchange. Soon thereafter, a lively trade in various derivatives, among which options and repos, emerged on the Amsterdam market. Dutch traders also pioneered short selling - a practice which was banned by the Dutch authorities as early as 1610. The main trading room of the Tokyo Stock Exchange,where trading is currently completed through computers. The stock market is one of the most important sources for companies to raise money. This allows businesses to be publicly traded, or raise additional financial capital for expansion by selling shares of ownership of the company in a public market. The liquidity that an exchange affords the investors gives them the ability to quickly and easily sell securities. This is an attractive feature of investing in stocks, compared to other less liquid investments such as real estate. Some companies actively increase liquidity by trading in their own shares. History has shown that the price of shares and other assets is an important part of the dynamics of economic activity, and can influence or be an indicator of social mood. An economy where the stock market is on the rise is considered to be an up-and-coming economy. In fact, the stock market is often considered the primary indicator of a country's economic strength and development. The smooth functioning of all these activities facilitates economic growth in that lower costs and enterprise risks promote the production of goods and services as well as possibly employment. In this way the financial system is assumed to contribute to increased prosperity. Statistics show that in recent decades shares have made up an increasingly large proportion of households' financial assets in many countries. In the 1970s, in Sweden, deposit accounts and other very liquid assets with little risk made up almost 60 percent of households' financial wealth, compared to less than 20 percent in the 2000s. The major part of this adjustment is that financial portfolios have gone directly to shares but a good deal now takes the form of various kinds of institutional investment for groups of individuals, e.g., pension funds, mutual funds, hedge funds, insurance investment of premiums, etc. From experience we know that investors may 'temporarily' move financial prices away from their long term aggregate price 'trends'. (Positive or up trends are referred to as bull markets; negative or down trends are referred to as bear markets.) Over-reactions may occur—so that excessive optimism (euphoria) may drive prices unduly high or excessive pessimism may drive prices unduly low. Economists continue to debate whether financial markets are 'generally' efficient. According to one interpretation of the efficient-market hypothesis (EMH), only changes in fundamental factors, such as the outlook for margins, profits or dividends, ought to affect share prices beyond the short term, where random 'noise' in the system may prevail. (But this largely theoretic academic viewpoint—known as 'hard' EMH—also predicts that little or no trading should take place, contrary to fact, since prices are already at or near equilibrium, having priced in all public knowledge.) The 'hard' efficient-market hypothesis is sorely tested by such events as the stock market crash in 1987, when the Dow Jones index plummeted 22.6 percent—the largest-ever one-day fall in the United States. This event demonstrated that share prices can fall dramatically even though, to this day, it is impossible to fix a generally agreed upon definite cause: a thorough search failed to detect any 'reasonable' development that might have accounted for the crash. (But note that such events are predicted to occur strictly by chance, although very rarely.) It seems also to be the case more generally that many price movements (beyond that which are predicted to occur 'randomly') are not occasioned by new information; a study of the fifty largest one-day share price movements in the United States in the post-war period seems to confirm this. However, a 'soft' EMH has emerged which does not require that prices remain at or near equilibrium, but only that market participants not be able to systematically profit from any momentary market 'inefficiencies'. Moreover, while EMH predicts that all price movement (in the absence of change in fundamental information) is random (i.e., non-trending), many studies have shown a marked tendency for the stock market to trend over time periods of weeks or longer. Various explanations for such large and apparently non-random price movements have been promulgated. For instance, some research has shown that changes in estimated risk, and the use of certain strategies, such as stop-loss limits and Value at Risk limits, theoretically could cause financial markets to overreact. But the best explanation seems to be that the distribution of stock market prices is non-Gaussian (in which case EMH, in any of its current forms, would not be strictly applicable). Other research has shown that psychological factors may result in exaggerated (statistically anomalous) stock price movements (contrary to EMH which assumes such behaviors 'cancel out'). Psychological research has demonstrated that people are predisposed to 'seeing' patterns, and often will perceive a pattern in what is, in fact, just noise. (Something like seeing familiar shapes in clouds or ink blots.) In the present context this means that a succession of good news items about a company may lead investors to overreact positively (unjustifiably driving the price up). A period of good returns also boosts the investor's self-confidence, reducing his (psychological) risk threshold. Another phenomenon—also from psychology—that works against an objective assessment is groupthink. As social animals, it is not easy to stick to an opinion that differs markedly from that of a majority of the group. An example with which one may be familiar is the reluctance to enter a restaurant that is empty; people generally prefer to have their opinion validated by those of others in the group. Sometimes, the market seems to react irrationally to economic or financial news, even if that news is likely to have no real effect on the fundamental value of securities itself. But, this may be more apparent than real, since often such news has been anticipated, and a counterreaction may occur if the news is better (or worse) than expected. Therefore, the stock market may be swayed in either direction by press releases, rumors, euphoria and mass panic; but generally only briefly, as more experienced investors (especially the hedge funds) quickly rally to take advantage of even the slightest, momentary hysteria. Over the short-term, stocks and other securities can be battered or buoyed by any number of fast market-changing events, making the stock market behavior difficult to predict. Emotions can drive prices up and down, people are generally not as rational as they think, and the reasons for buying and selling are generally obscure. Behaviorists argue that investors often behave 'irrationally' when making investment decisions thereby incorrectly pricing securities, which causes market inefficiencies, which, in turn, are opportunities to make money. However, the whole notion of EMH is that these non-rational reactions to information cancel out, leaving the prices of stocks rationally determined. The Dow Jones Industrial Average biggest gain in one day was 936.42 points or 11 percent, this occurred on October 13, 2008. 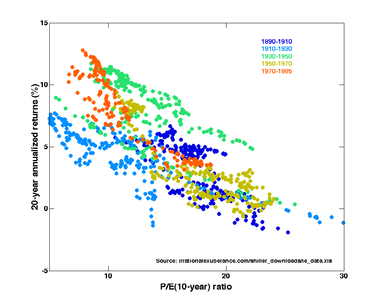 Price-Earnings ratios as a predictor of twenty-year returns based upon the plot by Robert Shiller (Figure 10.1, source). The horizontal axis shows the real price-earnings ratio of the S&P Composite Stock Price Index as computed in Irrational Exuberance (inflation adjusted price divided by the prior ten-year mean of inflation-adjusted earnings). The vertical axis shows the geometric average real annual return on investing in the S&P Composite Stock Price Index, reinvesting dividends, and selling twenty years later. Data from different twenty year periods is color-coded as shown in the key. See also ten-year returns. Shiller states that this plot "confirms that long-term investors—investors who commit their money to an investment for ten full years—did do well when prices were low relative to earnings at the beginning of the ten years. Long-term investors would be well advised, individually, to lower their exposure to the stock market when it is high, as it has been recently, and get into the market when it is low." A stock market crash is often defined as a sharp dip in share prices of equities listed on the stock exchanges. In parallel with various economic factors, a reason for stock market crashes is also due to panic and investing public's loss of confidence. Often, stock market crashes end speculative economic bubbles. There have been famous stock market crashes that have ended in the loss of billions of dollars and wealth destruction on a massive scale. An increasing number of people are involved in the stock market, especially since the social security and retirement plans are being increasingly privatized and linked to stocks and bonds and other elements of the market. There have been a number of famous stock market crashes like the Wall Street Crash of 1929, the stock market crash of 1973–4, the Black Monday crash of 1987]], the Dot-com bubble of 2000, and the Stock Market Crash of 2008. One of the most famous stock market crashes started October 24, 1929 on Black Thursday. The Dow Jones Industrial lost 50 % during this stock market crash. It was the beginning of the Great Depression. Another famous crash took place on October 19, 1987 – Black Monday. The crash began in Hong Kong and quickly spread around the world. By the end of October, stock markets in Hong Kong had fallen 45.5 %%, Australia 41.8 %%, Spain 31 %%, the United Kingdom 26.4 %%, the United States 22.68 %%, and Canada 22.5 %%. Black Monday itself was the largest one-day percentage decline in stock market history – the Dow Jones fell by 22.6 %% in a day. The names “Black Monday” and “Black Tuesday” are also used for October 28–29, 1929, which followed Terrible Thursday—the starting day of the stock market crash in 1929. The crash in 1987 raised some puzzles-–main news and events did not predict the catastrophe and visible reasons for the collapse were not identified. This event raised questions about many important assumptions of modern economics, namely, the theory of rational human conduct, the theory of market equilibrium and the efficient-market hypothesis. For some time after the crash, trading in stock exchanges worldwide was halted, since the exchange computers did not perform well owing to enormous quantity of trades being received at one time. This halt in trading allowed the Federal Reserve system and central banks of other countries to take measures to control the spreading of worldwide financial crisis. In the United States the SEC introduced several new measures of control into the stock market in an attempt to prevent a re-occurrence of the events of Black Monday. Since the early 1990's, many of the largest exchanges have adopted electronic 'matching engines' to bring together buyers and sellers, replacing the open outcry system. Electronic trading now accounts for the majority of trading in many developed countries. Computer systems were upgraded in the stock exchanges to handle larger trading volumes in a more accurate and controlled manner. The SEC modified the margin requirements in an attempt to lower the volatility of common stocks, stock options and the futures market. The New York Stock Exchange and the Chicago Mercantile Exchange introduced the concept of a circuit breaker. The circuit breaker halts trading if the Dow declines a prescribed number of points for a prescribed amount of time. In February 2012, the Investment Industry Regulatory Organization of Canada (IIROC) introduced single-stock circuit breakers. In short selling, the trader borrows stock (usually from his brokerage which holds its clients' shares or its own shares on account to lend to short sellers) then sells it on the market, hoping for the price to fall. The trader eventually buys back the stock, making money if the price fell in the meantime and losing money if it rose. Exiting a short position by buying back the stock is called "covering a short position." This strategy may also be used by unscrupulous traders in illiquid or thinly traded markets to artificially lower the price of a stock. Hence most markets either prevent short selling or place restrictions on when and how a short sale can occur. The practice of naked shorting is illegal in most (but not all) stock markets. In margin buying, the trader borrows money (at interest) to buy a stock and hopes for it to rise. Most industrialized countries have regulations that require that if the borrowing is based on collateral from other stocks the trader owns outright, it can be a maximum of a certain percentage of those other stocks' value. In the United States, the margin requirements have been 50 % for many years (that is, if you want to make a $1000 investment, you need to put up $500, and there is often a maintenance margin below the $500). Global issuance of equity and equity-related instruments totaled $505 billion in 2004, a 29.8 % increase over the $389 billion raised in 2003. Initial public offerings (IPOs) by US issuers increased 221 % with 233 offerings that raised $45 billion, and IPOs in Europe, Middle East and Africa (EMEA) increased by 333 %, from $ 9 billion to $39 billion. One of the many things people always want to know about the stock market is, "How do I make money investing?" There are many different approaches; two basic methods are classified by either fundamental analysis or technical analysis. Fundamental analysis refers to analyzing companies by their financial statements found in SEC Filings, business trends, general economic conditions, etc. Technical analysis studies price actions in markets through the use of charts and quantitative techniques to attempt to forecast price trends regardless of the company's financial prospects. One example of a technical strategy is the Trend following method, used by John W. Henry and Ed Seykota, which uses price patterns, utilizes strict money management and is also rooted in risk control and diversification. Additionally, many choose to invest via the index method. In this method, one holds a weighted or unweighted portfolio consisting of the entire stock market or some segment of the stock market (such as the S&P 500 or Wilshire 5000). The principal aim of this strategy is to maximize diversification, minimize taxes from too frequent trading, and ride the general trend of the stock market (which, in the U.S., has averaged nearly 10 % per year, compounded annually, since World War II). According to much national or state legislation, a large array of fiscal obligations are taxed for capital gains. Taxes are charged by the state over the transactions, dividends and capital gains on the stock market, in particular in the stock exchanges. However, these fiscal obligations may vary from jurisdictions to jurisdictions because, among other reasons, it could be assumed that taxation is already incorporated into the stock price through the different taxes companies pay to the state, or that tax free stock market operations are useful to boost economic growth. ↑ "World Equity Market Declines: -$25.9 Trillion". Seeking Alpha. http://seekingalpha.com/article/99256-world-equity-market-declines-25-9-trillion. Retrieved 2011-05-31. ↑ "Quarterly Review Statistical Annex – December 2008". Bis.org. September 7, 2008. http://www.bis.org/publ/qtrpdf/r_qa0812.pdf. Retrieved March 5, 2010. ↑ "Central Intelligence Agency". Cia.gov. https://cia.gov/library/publications/the-world-factbook/rankorder/2001rank.html. Retrieved 2011-05-31. ↑ "What's the difference between a Nasdaq market maker and a NYSE specialist?". Investopedia.com. http://www.investopedia.com/ask/answers/128.asp. Retrieved March 5, 2010. ↑ Ortega, Edgar (2006-12-04). "UBS, Goldman Threaten NYSE, Nasdaq With Rival Stock Markets". Bloomberg.com. http://www.bloomberg.com/apps/news?pid=20601109&sid=al86iws61SPY&refer=home. Retrieved 2011-05-31. ↑ "16de eeuwse traditionele bak- en zandsteenarchitectuur Oude Beurs Antwerpen 1 (centrum) / Antwerp foto". Belgiumview.com. http://www.belgiumview.com/belgiumview/tl1/view0002205.php4. Retrieved March 5, 2010. ↑ "PhD thesis 'The world's first stock exchange'". http://www.lodewijkpetram.nl/index-eng.html. Retrieved 2011-10-01. ↑ "World Federation of Exchanges Monthly YTD Data". World-exchanges.org. http://world-exchanges.org/statistics/ytd-monthly. Retrieved 2011-05-31. ↑ Cesari, Amedeo De; Espenlaub, Susanne; Khurshed, Arif; Simkovic, Michael (2010). "The Effects of Ownership and Stock Liquidity on the Timing of Repurchase Transactions". Paolo Baffi Centre Research Paper No. 2011-100. ↑ Simkovic, Michael (2009). "The Effect of Enhanced Disclosure on Open Market Stock Repurchases". Berkeley Business Law Journal 6 (1). ↑ "No. HS-38. 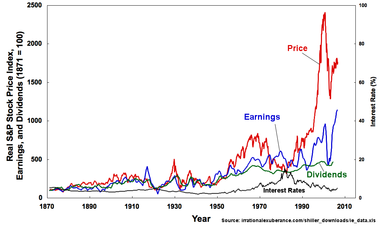 Stock Prices and Yields: 1900 to 2002" (PDF). http://www.census.gov/statab/hist/HS-38.pdf. Retrieved 2011-05-31. ↑ a b Cutler, D. Poterba, J. & Summers, L. (1991). "Speculative dynamics". Review of Economic Studies 58: 520–546. ↑ Mandelbrot, Benoit & Hudson, Richard L. (2006). The Misbehavior of Markets: A Fractal View of Financial Turbulence, annot. ed.. Basic Books. ISBN 0-465-04357-7. ↑ Taleb, Nassim Nicholas (2008). Fooled by Randomness: The Hidden Role of Chance in Life and in the Markets, 2nd ed.. Random House. ISBN 1-4000-6793-6. ↑ Tversky, A. & Kahneman, D. (1974). "Judgement under uncertainty: heuristics and biases". Science 185 (4157): 1124–1131. doi:10.1126/science.185.4157.1124. PMID 17835457. ↑ Morris, Stephen; Shin, Hyun Song (1999). "Risk management with interdependent choice". Oxford Review of Economic Policy 15 (3): 52–62. doi:10.1093/oxrep/15.3.52. ↑ Sergey Perminov, Trendocracy and Stock Market Manipulations (2008, ISBN 978-1-4357-5244-3. ↑ "News Headlines". Cnbc.com. October 13, 2008. http://www.cnbc.com/id/27166818. Retrieved March 5, 2010. ↑ a b c Shiller, Robert (2005). Irrational Exuberance (2d ed.). Princeton University Press. ISBN 0-691-12335-7. ↑ Chris Farrell. "Where are the circuit breakers". http://www.publicradio.org/columns/marketplace/gettingpersonal/2008/10/where_are_the_stock_market_cir.html. Retrieved October 16, 2008. Preda, Alex (2009). Framing Finance: The Boundaries of Markets and Modern Capitalism. University of Chicago Press. ISBN 978-0-226-67932-7.